Why do you sometimes see double rainbows? 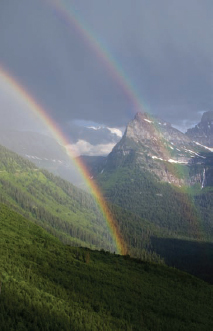 Sometimes rainbows form that have a fainter twin called a “supernumerary rainbow.” The twin will be bigger and above the first rainbow, and the colors of the bands will be reversed. This occurs when not all of the light is reflected out of the raindrops at once; some light energy remains, and is reflected within the droplets before emerging as a second rainbow. Double rainbows sometimes form, with one being slightly fainter than the other, and the colors reversed.